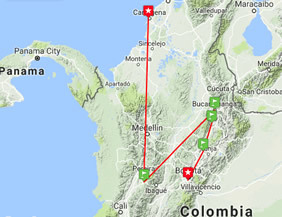 Bogota, Armenia, Salento, Cocora Valley, Jardin, Santa Elena, Medellin, Cartagena, and more! Beautiful scenery, amazing hotels, authentic community experiences and cultural immersion are the cornerstone of this inspiring gay group adventure to Colombia, complemented with restaurant hopping, street food and chef signature gastronomy. Colombia's landscape is marked by rainforests, Andes mountains and numerous coffee plantations. In the high-altitude capital, Bogotá, the Zona Rosa district is known for its restaurants and shops. 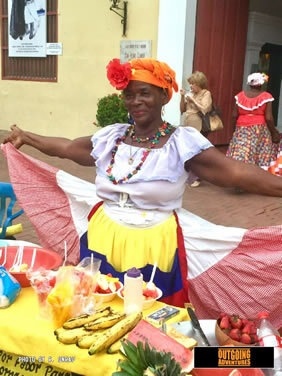 Cartagena, on the Caribbean coast, has a walled colonial Old Town, a 16th-century castle and nearby coral reefs. 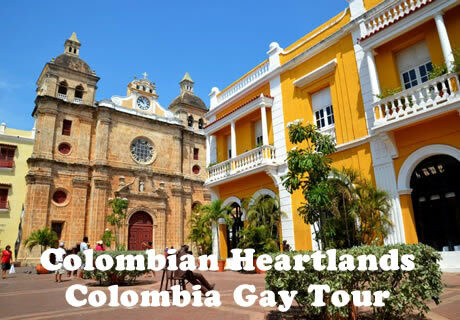 This marvelous gay group tour itinerary combines the best of Bogota, the Coffee Triangle and an extension to Cartagena. Delight in urban art, history, culture, gastronomy, and rural agricultural experiences with local baristas in the coffee growing region. Scenic landscapes, colours and flavours and highly-qualified guides make this a one-of-a-kind travel experience. We get up early this morning and fly from Bogota to Armenia. The rich volcanic soil together with the climate and the topography make this region ideal for the cultivation of quality coffee. For much of the last century coffee was one of the mainstays of the Colombian economy but over the last 20 years the importance of coffee to the Colombian economy has reduced. There are a number of working coffee farms around the Salento area, and we will explore one of them today. 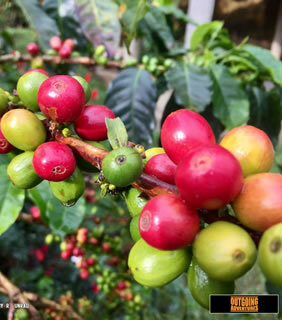 To fully experience the Zona Cafetera you must visit a working coffee farm (Finca) and walk amongst the coffee plants. This lush, green region not only has a temperate climate for travellers but is also home to the snow capped peaks of the Parque National Los Nevados. This region's terraced slopes provide the perfect environment for the coffee to grow with the climate and precipitation levels being ideal. We will enjoy a walk around the center of town, taking time to explore the main plaze. Here visitors are drawn by its kaleidescope of colours, as Jardín vies for the crown of Colombia's most colourful town with its brightly painted tables, cowhide chairs and colourwashed façades. During our afternoon of touring we will ride a cable car to the top of a mountain overlooking Jardín. Completed just 10 years ago, this 5-minute gondola ride provides the best views of Jardin and the encompassing central valley. We will stroll through the hustle and bustle of downtown. We will see the famous Botero Plaza with its exhibition of the Colombian artist Fernando Botero, whose sculptures have become a landmark of the city. We will take the Metro Cable up to Santo Domingo, which was once a notorious area of gang violence in Medellin. The cable car was constructed to make the inner city more accessible to people from the outskirts, and allows visitors a glimpse into the lives of the marginalized population. While enjoying the spectacular view you will learn more about the transformation of Medellin from the most dangerous city in the world into a fascinating melting pot of cultures with possibly the friendliest and warmest people in the world. We will be sure to visit Parque Lleras, one of Medellín's must-see quarters as well as the Metropolitan Cathedral. You are then free to find lunch and enjoy an afternoon of exploration before we meet later this afternoon, when colonial carriages will take us for a ride around the city before our final dinner. This afternoon may want to visit the local Gold Museum with its amazing and priceless national collections, and interesting rooms that recreate the region's Amerindian ethnic groups. Though small, this museum offers a fascinating collection from the Zenu (also known as Sinu) people, who inhabited the region of the present-day departments of Bolívar, Córdoba, Sucre and northern Antioquia before the Spanish Conquest. Well-located, heated / air-conditioned, mid-upper range (3-star) hotels with en suite toilet and bath throughout. Land transport throughout by private air-conditioned motor coach or minibus depending on ultimate group size. Though we will have some full bus days, road travel is not particularly arduous as there are plenty of stops of interest. Most roads are in good condition though winding on some stretches. Numerous walking tours on uneven surfaces. Most people are not seriously affected by altitude (2400-3300 m / 8,000-9,500 ft). Flights via scheduled local carrier. Our difficulty level "2" rating refers to the above-mentioned busy days, walking tours on uneven terrain, lack of handrails (public and elsewhere, ie shower stalls), and fatigue that can be caused by heat and humidity. Both our hike and mountain biking in Santander are downhill - no experience is required, but a bit of conditioning prior to any trip is always a good idea! Is Colombia safe? Unfortunately people still ask this question, despite the country making huge strides in recent years to reign in illegal drug-related activity. 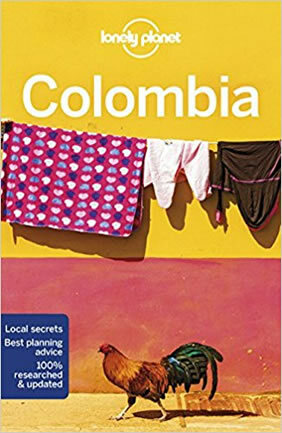 Visitors to Colombia encounter a highly-developed, prosperous society with excellent infrastructure, world-class service, and very low crime rates. And some of the friendliest and welcoming people you'll ever meet! Here the weather and climate are truly those of 'perpetual spring,' as understood in temperate latitudes. Nights are cool but never really cold, and at this height frost is unknown. The days feel warm in the sun but are never really hot. Rain and afternoon cloud are frequent. Sunshine averages from three to five hours a day throughout the year. Cartagena, however, is hot and humid-year round. Overall, the best time to visit is between December and April (we avoid the busy and expensive Christmas/ New Year's period). Immerse yourself in the sights, sounds and attractions of Bogotá, Colombia as a distinguished guest of the Bohème Royal Hotel. Perfectly located in the heart of Bogotá’s “Zona Rosa” dining and entertainment district, this refined destination represents the best of Bogotá’s hotels with an elite level of guest service and unmatched amenities. Encircled by eclectic boutiques and fashionable restaurants, minutes from the Andino, Retiro and Atlantis Plaza shopping centers, our dynamic hotel is equally suited for relaxing executive travel and stylish holidays in the Colombian capital. Surrounded by extensive gardens, this colonial style guest house boasts an outdoor swimming pool in Pereira. There are charming Spanish-style galleries, hammocks and stone fountains. All rooms have garden views and free Wi-Fi. 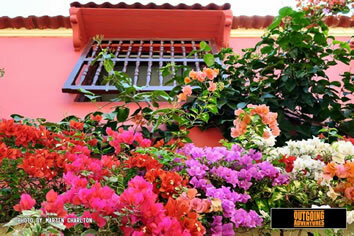 Casa de Huéspedes Hacienda Castilla has rooms with flat-screen cable TV and private bathrooms with showers. An American breakfast with world famous Colombian coffee is served daily. Regional flavours are offered at the restaurant. Overlooking Maravelez Valley, this unfussy rural hotel is surrounded by lush tropical vegetation and lies 3 km from the Tulaima centro recreacional y turístico. It's also 14 km from Aeropuerto El Eden. Casual rooms feature flat-screen TVs, minibars, and balconies with hammocks. Room service is offered. Mirador de las Palmas amenities include an airy restaurant with vaulted ceilings and floor-to-ceiling windows, and there's a bar. A sundeck surrounds an outdoor pool and features panoramic valley views. Other amenities include a hot tub, a soccer field, and a spa with a sauna. 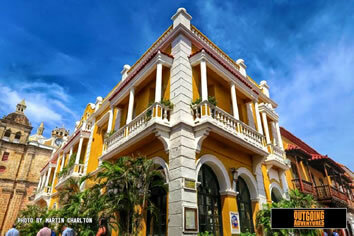 In a colonial-era building in the walled old town, this charming hotel is 6 minutes' walk from both Casa de Gabriel Garcia Marquez and the Museo de Arte Moderno de Cartagena de Indias. Don Pedro de Heredia Hotel rustic rooms provide cable TV, free Wi-Fi, minibars, and tea and coffeemakers. Many have balconies. A breakfast buffet is served in a restaurant that has a terrace. There's also an interior courtyard, a sundeck and an outdoor pool.